Tough jobs require even tougher cars, and that’s what we can learn from the Japanese law enforcement unit. As kings of the road since the 90’s, the Japanese police cars can definitely make you look twice and make you wish you were a police officer. They’re not just fast; they’re also integrated with the most sophisticated technology, making them the complete bad boys of the road! Want to take a glimpse of some of the best police cars around the world? Here’s some of the Japanese cars that made it on our list! A Japanese sports car that picked up some of its features from the Nissan Skyline models, the Skyline GT-R series is a legendary touring car that gained enormous success since it was released in the late 60’s. Hailed as the “Godzilla” of the road, the Nissan R34 Skyline GT-R can give you more than enough reasons to go green with envy as it is still one of the best pursuit cars to date! So if you are on the lookout for a Japanese police car made with cutting-edge technology, the Nissan R34 Skyline GT-R is one of your best bets. Think sports cars only belong to the racing tracks? Not in Japan! A two-seater, mid-engine racing car built for speed, the Honda NSX is a Japanese police car designed to take on the most dangerous roads. Made with lightweight chassis and Senna-approved suspensions, the Honda NSX can surely discourage lawbreakers out on the leash. Just imagine being chased by a sports car for a minor driving offense, and you’ll get the point. The Japanese law enforcement unit surely knows how to make a red carpet entrance. With the Mazda RX-7 as one of its world-renowned police cars, it’s hard not to make a lasting impression to local and international passersby alike. Manufactured from the year 1978 to 2002, the Mazda RX-7 is a rotary icon that boasts a timeless chassis and a rear-wheel drive layout. Thanks to its legendary frame, it has been featured in several Hollywood movies, including Gran Turismo and the Fast and the Furious. Fortunately, you can still get your hands on the Mazda RX-7’s wheels by taking a look at the Japanese used car auction. With Mazda RX-7 as its predecessor, it’s hard to picture the Mazda RX-8 in a bad light. A sports car run by a Wankel engine, the Mazda RX-8 is hard to beat in a road chase, making it the perfect Japanese police car. Aside from its tough engine, it has classy and near-robotic interiors that can make you feel like you are riding in a car from the future. The Subaru impreza proves that it is not just your regular family car as it can also be a great addition to the law enforcement unit, thanks to its high-performing variants. 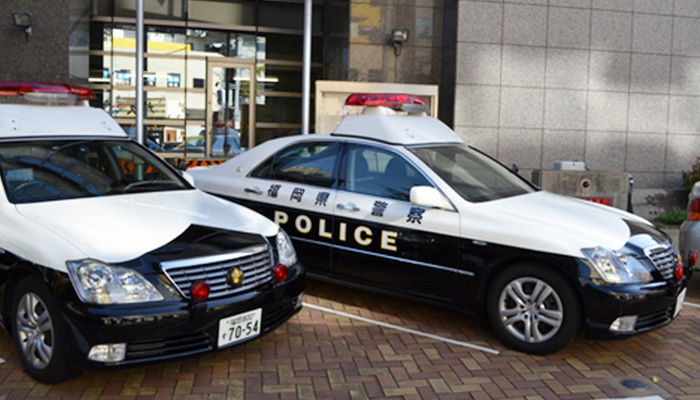 Aside from its sleek, compact design, this Japanese police car is also a tough contender on the road. Available in 4 and 5-door variants, the Subaru Impreza redefines driving comfort and convenience. The Nissan Fairlady Z proves that it is way beyond dainty and fair as it is also one of the best police cars around the world. Also sold as Nissan S30 and Datsun 240Z in international car markets, the Nissan Fairlady Z is among the most successful sports cars to date. Aside from its remarkable layout, it’s also a fast and highly reliable model that can compete against high-end touring cars. Nothing spells “luxury” better than the Toyota Crown, but aside from its mouth-watering features, it is also a strong contender on Japanese roads. A popular model in Japanese used car auction, the Toyota Crown is a mid/full-sized sedan first sold in Asian markets. Because of its one-of-a-kind internal and external features, the Toyota Crown has gained recognition around the globe for its versatility, speed and superior comfort. So if you want to be witness royalty in action, it’s time to book a ticket to Japan. Indeed, with these top police cars swarming the Japanese roads, you don’t need to buy a ticket to a race to see legendary models and makes. Just visit the busy Japanese streets and you are already in for a car feast!